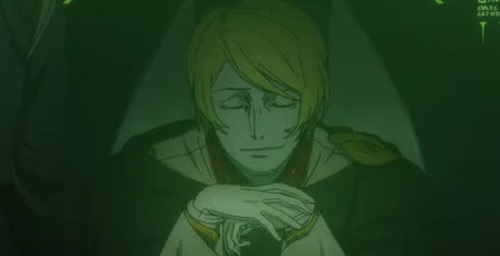 I am getting thoroughly bored of being right in my predictions about Space Battleship Yamato 2199. There’s a first; I’m sick of being right. Witness this particular episode as the second movement in the Yamato two-step of story-telling. In the first motion, the series telegraphs that something big is going to happen over the course of an episode or two. Then, lo and behold, something big happens in the exact way that any half-witted viewer would have seen coming. I ask you, where is the fun in a series that operates this way? For anybody who didn’t read my last SBY 2199 post, I interpreted all of Field Marshall Zoellek’s hubris and bombast as a signal indicating that Dessler is actually alive. Guess what happened in this episode. Go on, I dare you. Did you guess that Dessler’s death was a hoax? If Dessler wasn’t going to die and stay dead, what was the point in the last few episodes’ worth of world building on the Gamilan side of the equation? Misdirection is all well and good in a television series, but outright lying to the audience demands some greater purpose. I don’t see a purpose here. All I see is a long-con gimmick designed to make telling the third act a little easier on the writers. To illustrate this point, I’ll have to take you through the even poorer story telling of the episode’s first half. Episode eighteen begins with a recon mission through the Balun gate. By rights, the pilot sent on this mission is a red shirt. In fact, I don’t think Ensign Shinohara was a named character prior to this episode. He was just a guy with a very non-military haircut. The writers further allude to Shinohara’s red shirt nature with a few other bits of dialogue. Captain Okita specifically comments on how dangerous his recon mission is going to be. Ensign Yamamoto gives Shinohara a lecture on how out of character it is for him to volunteer for the recon flight. Yamamoto also reminds Shinohara that his duty, as a recon pilot, is to return to the Yamato with the required data. In this case, that data is the location of the warp gate to the Greater Magellenic Cloud. Every drop of storytelling wisdom I’ve ever consumed in my years as a writer and critic says that Shinohara is about to give his life for the cause. Then it happens. The writers backfill on Shinohara. If we learned anything in episode seventeen, it’s that once a named character gets a back story, they’re functionally bullet proof for the short-term future. Detailed scans from Shinohara’s mission reveal that there are nearly 10,000 Gamilan ships orbiting Balun – for some reason, Zoellek made a naval review his first order of business as Gamilan high commander. Despite this knowledge, Captain Okita orders the Yamato through the gate. Cue awesome battle music and pew-pew lasers. Only before the grace of Zoellek’s incompetence, which sees the Gamian fleet fighting in a gangly parade formation around Balun, does the Yamato survive an encounter with seemingly every ship in the Gamilan navy. Okita’s send-off to this massive fleet is nothing less than the destruction of Balun itself. Using the wave motion gun, Okita blasts the reactor at Balun’s core, disabling the all warp gates in the system. The shot also destroys – or so it seems – the Greater Magellenic Cloud warp gate just as the Yamato passes through it. Hooray for the good guys, right? No not so much. The entire sequence feels like a tacky way of dealing with the fact that the Gamilans, by rights, should have leveled the Earth and Yamato ages ago. With a military of their size, they are no mere allegory for Nazi Germany. In a Second World War context, Gamilas’ strength seems more akin to the combined military might of America, the United Kingdom, Japan, Russia, and Nazi Germany. Rather than exploring that power in a meaningful way i.e. 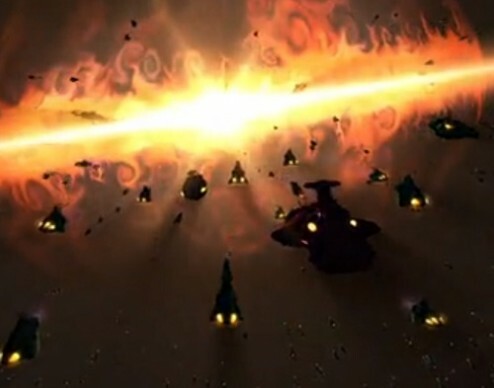 a full-on Gamilian civil war or even an invasion of the Gamilan Empire from the vanguard of the White Comet Empire – who if you will recall were introduced earlier in this series – the writers have stranded the majority of the Gamilan fleet at Balun. Certainly, they could use their ship-based jump drives to get back to Gamilas and Iscandar, but the Yamato now has a considerable head start on any counter attack. When we cut to the core of the issue, this entire episode feels like an homage to cheap solutions for otherwise interesting problems. Shinohara should have died on his recon mission. Everybody knows that unless your name is Starbuck, fighter pilots are red shirts with more swagger. Keeping him alive only serves to further cheapen SBY 2199 as a war story. Zoellek’s review of the entire Gamilan navy is just stupid. Not even a half-baked military commander puts all their forces in one place at one time for the sake of a review. Therein, Dessler’s return was predictable and lacked the shock and awe that came with his apparent death all those episodes ago. SBY 2199 needs to grow up, kill some characters who aren’t Gamilans, and do something, anything, more interesting than telegraphing to the audience. – Domel was sentenced to death. Did that happen yet? – Yurisha Iscandar is now in full possession of Misaki’s body. All signs point to the need for an old priest and a young priest to get rid of her. All of the Yamato’s senior officers seem fine with this. Really? Nobody objects to this? Well, I visited this page for some confusion of the episode.